Today I'm building a foldable and storable clothes drying rack made out of three cedar 1x4's and some wooden dowels. 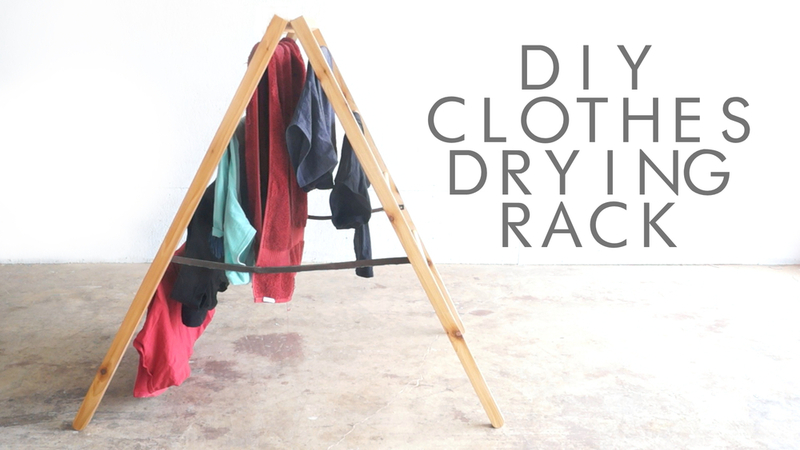 This is a great project if you want to keep your shirts from shrinking or if you need a way to air-dry clothes without a clothesline. Leather strap (or any material really) for stop. I started by cutting a cedar 1x4 in half and ripping it into 4 - 1.5" pieces. Next, I drilled four holes to fit the wooden dowels. I had two pieces clamped together to ensure the two pieces would be symmetrical. Then, I glued up two of the four 48" boards together: one board with holes, one without. Next, I marked and sanded a radius on the bottom of each leg. Then I sanded all of the faces up to 220 grit. Next I cut my dowels to length (26") and glued them in, making sure to keep everything square as I clamped it up. From a second cedar board, I made another set of boards similar to the legs...just without the holes for the dowels. This will make the brace for the top of the rack. I sprayed the finish outside for ventilation. It also dries a lot faster in the sun. I clamped my two racks together in place and installed the hinges. As a final step, I added a leather strap as a stop to ensure the rack could only open to a certain amount. I used brass screws to match the hinges. That's all there is to it! I hope you enjoyed it and go out and make your own. If you do, don't forget to tag me in a picture of it!